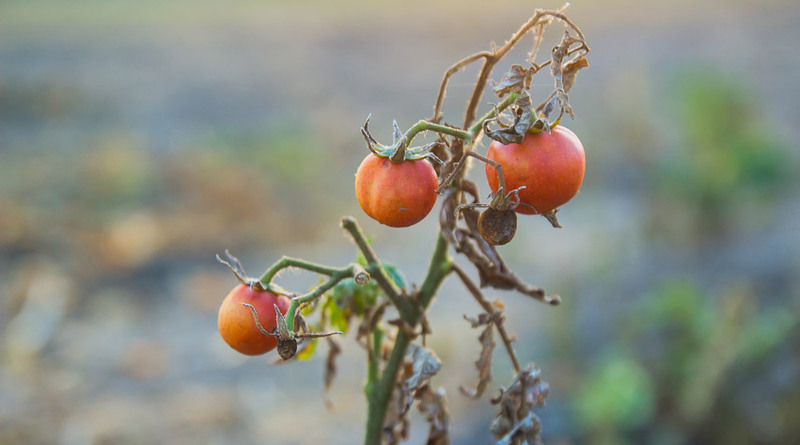 Blight is a serious disease of potatoes and tomatoes, which can ruin the crops of both vegetables, making them totally inedible. Check plants regularly for symptoms. What is potato blight and tomato blight? Potato blight (sometimes referred to as late blight) and tomato blight are serious diseases of these two crops. They spread rapidly on the foliage and then affect the potato tubers or tomato fruit, resulting in a total rot, making them inedible. The affected potatoes and tomatoes taste disgusting, so don’t attempt to eat them. 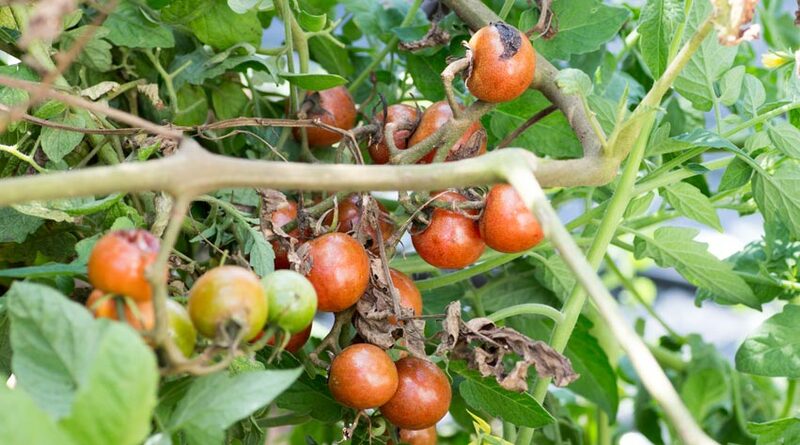 Blight is specific to potatoes and tomatoes, but may sometimes attack some closely related ornamental Solanum species, such as Solanum crispum and petunias. Attacks can start from June onwards, and are very dependent on the weather – temperature and humidity. When these are correct, the disease becomes very widespread and devastating, which is why blight is always worse in a warm, wet summer. Blight was responsible for causing the Irish potato famine in the 1840s. What is potato blight and tomato blight caused by? Potato blight and tomato blight are caused by Phytophthora infestans, which is a fungus-like organism. It overwinters in rotten potatoes or tomatoes left in the ground or outside. Most garden and allotment infections come from spores blown in from other gardens, allotments and field-grown commercial crops. The spores need a film of moisture on the plant leaves to develop, so droplets of water or high humidity around the leaves are needed. Once they develop, the disease spreads rapidly to other leaves, stems, tubers and fruit. Try to keep plants growing as strongly as possible to help them fend off disease attacks. However, when a large outbreak of blight strikes your area, it may not be possible to do much about it. Tomato plants growing in the greenhouse may not be affected – as long as you can keep the doors and vents closed to prevent the spores entering. Pick off affected leaves when blight first strikes to reduce or slow down the spread of the disease. This is highly unlikely to eradicate the disease. Badly infected potato and tomato plants should be removed and disposed of, especially when growing close to unaffected plants to reduce the disease spread. Either burn them, put them in the council’s green waste bin or bury them – at least 45cm (18in) deep. Use a four-year crop rotation for potatoes to reduce the risk of infection from affected soil. Remove all potatoes left in the soil before spring. Earth up potatoes since the extra thickness of soil may provide some protection to the tubers. Potatoes that are harvested early, especially first earlies, are more likely to escape infection. Cut down the stems of affected potato plants to near ground level and dispose of the plants to prevent the spores affecting the tubers. Leave the potatoes in the ground for a couple of weeks for the skins to harden before harvesting. Check stored potatoes regularly for signs of decay. There are some potato and tomato varieties that are regarded as being blight disease resistant. Bear in mind that the genetic strains of blight change, which can lead to this resistance breaking down. Currently, the ‘Sarpo’ varieties of potatoes are regarded as being the most blight resistant. Tomato ‘Crimson Crush’ is regarded as the most blight-resistant tomato. Grafted tomato plants, which are more vigorous, may be able to fend of blight better than those plants grown from seed. As attacks are very dependent on weather conditions – the correct combination of temperature and humidity – outbreaks can be accurately predicted. Visit the Blight Watch website, which provides a free service that sends you e-mail warnings when blight is predicted to appear in your neighbourhood.